The village needs protection, and only the heroes stand in the way of danger and destruction! Flip-Mat: Village Square sets the scene for a variety of rural settlement encounters, from saddling up to the local tavern bar, saying your prayers at the community shrine, or fighting your way into a conference with the village elders. As an added bonus, this Flip-Mat can be placed alongside other urban Flip-Mats to create a sprawling townscape! This portable, affordable map measures 24" x 30" unfolded, and 8" x 10" folded. Its coated surface can handle any dry erase, wet erase, or even permanent marker. Usable by experienced GMs and novices alike, GameMastery Flip-Mats fit perfectly into any Game Master’s arsenal! On tabletops across the world, the Flip-Mat Revolution is changing the way players run their fantasy roleplaying games! Why take the time to sketch out ugly scenery on a smudgy plastic mat when dynamic encounters and easy clean-up is just a Flip away? Note: GameMastery Flip-Mat: Village Square has gone out of print and has been replaced by Pathfinder Flip-Mat Classics: Village Square. Permits simple usage with the indoor version OR a more DM-centric drawn version on the flip side. If Paizo wants blank sides, THIS IS THE WAY TO DO IT!!!! This is By Far the most useful Flip Map I have ever bought! This Map seldom leaves the gaming table! The Villiage square side is Perfect for all those in town battles and stealth missions, in and out of the city. And the Flip side is Great for everything from Forests to Mountains (with the addition of a few added terrain features). I highly recommend that anyone using miniatures Buys This Map! Announced! Image is very much a mockup. Looking forward to village triangle and circle. Will one of these sides be blank? One side will be the village square; the other side will be a cobblestone background. 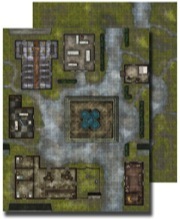 Will the "Blank" side (Yes I am still am going to call it a blank side, because that is how I see it), at least be different then the cobblestone blank side of the GameMastery Flip-Mat: City Market? If not why are you re using it since City Market is still available? I'd suspect because the City Market is on the "not too many copies remaining" list and the Village Square is intended as its replacement, especially since some people may want a cobblestone gridwork of an empty market square that they can drop a weekly farmer's market or occasional royal parade down onto and that won't be an option for newer customers once City Market is out of print. Can I spoil a little here? The flip side of this is NOT blank and does NOT use the same texture as the City Market. Any idea how long it'll be before theres a solid release date for this? I really want to use it for the campaign I'm starting. The quaint village scape would be perfect for the heroes home town. I had planed on running the first session the last week of January, but if this will be available early February as opposed to late February it would be worth waiting for. We don't set solid release dates until things are actually in our warehouse, but we're currently anticipating that all of our February products will begin shipping in the middle of the month. Many people, including me, have asked for this repeatedly. The answer has always been "no, we think it will cut into our sales of the physical version too much." I removed a post. Please don't advocate illegal activities on our messageboards. Shame you could not actually answer the substance of the deleted post and just censored the entire post. Is gbonehead comment correct that Paizo will not sell electronic versions of their map productsbecause it will effect physical sales? If this is true then I think it is very short sighted as it is costing you a potential sale from me, I only want to spend money with you on your map products in a format that I want. A point i made quite clearly in my deleted post. I think if a product is not available ina convenient format people or rather ex-customers will look for alternatives. It's hard to say if they're right or wrong. PDF sales seem to have worked out okay, so I'm not sure why flip mats or map packs would be any different. And, of course, the fair use copyright laws (in the US, can't speak for other countries) allow you to scan your items for your use, though you'll need a big honking scanner to scan a flip mat. We believe that if we offered our Map Packs or Flip-Mats in PDF form, a significant number of gamers would choose the PDF edition exclusively over the print edition, which would mean smaller print runs for the print edition, which—since print costs are based largely on volume—would in turn mean higher costs for the print edition, which would lead to even smaller sales for it, which would mean we wouldn't have a profitable line anymore. Of course, since gamers would have to print them and laminate them in order to get anything even remotely resembling the same quality, and that would probably be more expensive than just buying them in the first place, I can't see any real gamers who intend to use them at the table *not* buying the print version. And you know what I realized? I don't care if they're ever offered as PDFs. What I really want is *thumbnails* of them so I can put them into my Word documents and put a key on them for reference, etc. Nowadays, I use the preview versions for that, after using The Gimp pretty heavily to make them legible, and on the rare occasions that one of the flip mats is used in an Adventure Path or module, I use that image. I have my doubts about that , it may be true for your Map packs which are small sized images and easily printed but the larger maps are expensive to print from a domestic ink jet and of limited durability. I know this having printed out maps scanned from modules in the past, They rarely survive a nights play intact. I would always prefer to have a laminated battle map. I have a few of them and I get good use out of them, what I want to do have a digital copy I can use in Maptool or D20pro. There are plenty of products like this for sale on drivethrurpg and its a shame I can't buy them from Paizo as well because I like their maps. What if the PDF was only available bundled with a physical mat? That's pretty close to a "only subscribers get a PDF" suggestion that I've seen a few times; I've never actually seen a response to that one.